Choosing the right color scheme will make your home stand out. 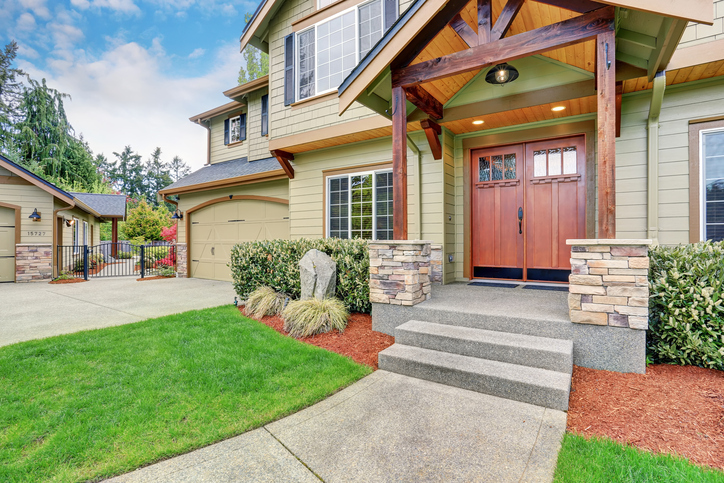 Choosing the right exterior colors for the outside of your home can be an overwhelming task. You don’t just have to pick one color; you have to choose the right siding, trim, and accents for your neighborhood and personality. Beyond the pressure to choose the right color combination, painting your home is a serious financial investment. Siding covers up the most space on the outside of your home and will consequently be the most noticeable color and the biggest budget item of your exterior project. Before you get carried away looking at outrageously fun exterior colors, remember that it needs to match fixed elements on and around your home. What color or material is your chimney? What color is your neighbor’s house? Gray-blues, neutral beige tons, and brick-brown are the most popular choices. Trim is typically at least a shade or two lighter than siding. This allows the home to look and feel more dynamic from the outside. When trim is painted the same color as the siding, the home looks flat and one-dimensional. Light grays, creams, and white shades are the most popular picks for this part of the exterior. Accent colors are your chance to make your home feel like, well, you! Think of your personal favorite colors or colors that describe you and your family. Make a list and compare it with the choices you’ve already made for siding and trim to see which pop of color is right for the project. Consider painting your front door a bright red to stand out during the holidays. Think about making your shutters a rich green to compliment all of your hard work landscaping and the oak tree in your front yard. This is the place to have fun without apology (or worrying too much what the neighbors think). Most shoppers looking for accent colors pick from a huge range of blues, browns, and black lacquer.